This week’s theme was “no news is good news”. After several weeks of dire headlines, this week produced very little on the news front. That reprieve from bad news was all this market needed to surge to record highs. As I’ve been saying since early August, a market that refuses to go down will eventually go up. This proved to be the week we’ve been patiently waiting for. 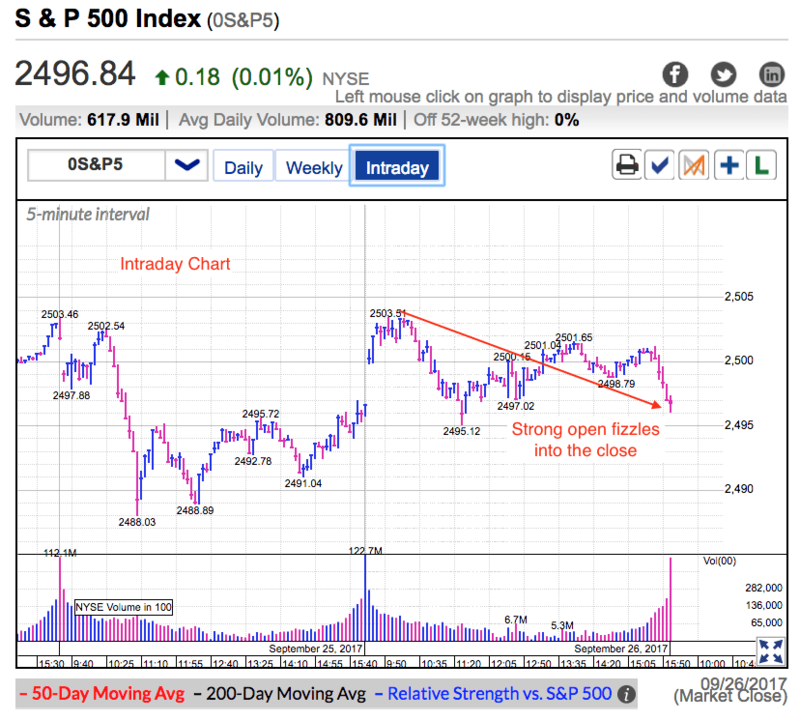 This is a mild breakout as far as breakouts go, but there is nothing wrong with that. The market likes symmetry and last month’s 2% pullback was modest. As a result we should expect an equally modest rebound. This is a healthy market and there is nothing wrong or unusual with these slow and methodical gains. Few things calm nerves like rising prices. Many of last month’s sellers are quickly going from fear of a crash to fear of being left behind. Underweight money managers are who were waiting for a bigger pullback are starting face the possibility it isn’t going to happen. If this market was vulnerable and fragile, last month’s headlines would have sent us tumbling. Standing strong through both the figurative and two literal storms tells us the path of least resistance remains higher. 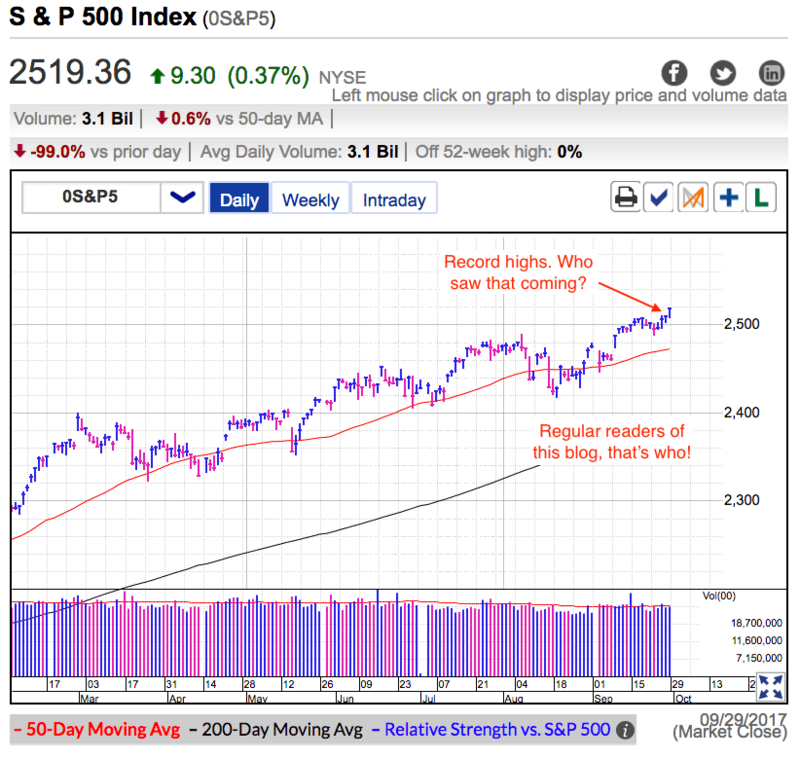 Gains will continue to be slow and choppy over the near-term, but expect the pace of gains to pick up later in the year as big money starts chasing performance into year-end. In a directional market, a late fizzle like this would be a big red flag. It warns us there is no follow through and support is crumbling. But this isn’t a directional market and traditional trading signals don’t apply. We have been stuck in a predominantly sideways market most of this year and every breakout and breakdown has been a false alarm. Anyone who failed to realize this has been making the exact wrong trade at the exact wrong moment. Buying the breakout just before it fizzles and selling the breakdown just before it rebounds. Unfortunately the market fools traders with these tricks far more often than people are willing to admit. That’s because it is nearly impossible to come to the market without a bullish or bearish bias. Many traders cognitively know the market trades sideways 60% of the time, but in the moment they always think prices are either about to take off, or on the verge of collapse. Score 10/10: In a more typical market, Tuesday’s weak close would have been big red flag and an attractive entry for a short trade. But this isn’t a typical market and we must ignore traditional trading signals. Just as I suspected, Tuesday’s weak close was nothing more than a false alarm and the next four trading sessions saw us charge to record highs. Volumes have been average or above since Labor Day. Big money finally returned from vacation and is getting back to work. It is encouraging to see they are more inclined to buy this strength than sell it. Fragile and vulnerable markets tumble quickly. Sticking near the psychologically significant 2,500 level for nearly three-weeks tells us the foundation under our feet is solid. Earlier in the week we dipped under support, but rather than sell this technical violation, many traders rushed in to buy the dip. Ignore what the bears are saying, this market is healthy and poised to continue higher. August’s basing pattern refreshed the market by chasing off weak owners and replacing them with confident dip buyers. Given how long we have been holding near the highs tells us few owners are taking profits and most are confidently waiting for higher prices. As long as confident owners keep supply tight, expect the drift higher to continue. Score 10/10: Big money is buying this market, not taking profits. The path of least resistance remains higher and Friday’s surge into record territory confirms it. Without a doubt this market wants to go higher and it is running over anyone who doubts it. I started a new educational series and will publish new articles each Monday and Wednesday. Sign up for Free Email Alerts to be notified when new articles are published. I included a brief quote from each educational piece below. Click on the headline to read the entire article. And don’t forget to come back for next week’s new educational pieces. The S&P500 only closed higher by 0.12%, but that was enough to hit a new record close. Gains have been slow, but steady. There was no meaningful news driving today’s strength, simply a continuation of the recent drift higher. Given how ominous the last several weeks have been, at this point no news is good news. As I’ve been saying for a while, a market that refuses to go down will eventually go up. It’s been several days since a North Korea headline hit the front page, but even if it did, the market has grown immune to those headlines and it will take something spectacular to dent this rally. Anyone who was afraid of North Korea sold weeks ago. When there is no one left to sell the news, it stops mattering. The GOP released its tax reform proposal and the market is cautiously optimistic. Given how poorly Republicans handled healthcare, most traders are taking a cynical approach to tax reform. I suspect something will pass eventually, but it will look far different than what was proposed. But at this point anything is a positive since the stock market has largely given up on tax cuts. The easiest way to see the lack of hope is how little the stock market reacted to healthcare’s defeat. The market barely flinched at Trump’s and the Republican’s political humiliation. If traders had high expectations for tax reform, we would have seen a much bigger reaction to the Republican’s inability to get anything accomplished. August’s 2% pullback was quick and shallow. The market likes symmetry and as a result the subsequent rebound has also been equally unspectacular. There is nothing wrong with that, but it also isn’t a surprise or a concern how slow the breakout has been. Recent sellers are still nervous and it will take a little longer before they conceded selling last month was a mistake and buy back in. But few things calm nerves like rising prices and soon the fear of losses will be replaced by fear of being left behind. Expect the gains to be slow and choppy over the near term, but soon underweight money managers are going to give up waiting for a larger pullback. Their chasing prices higher will give the market a boost in the final months of 2017. As long as the gains are slow and steady, they will be sustainable. I will get a lot more defensive if the rate of gains ramp up. A good opportunity to take profits could be following a pop on a tax reform agreement. Expect these daily gyrations to continue, but the path of least resistance remains higher. Stick with what has been working and that is buy-and-hold and adding on dips. 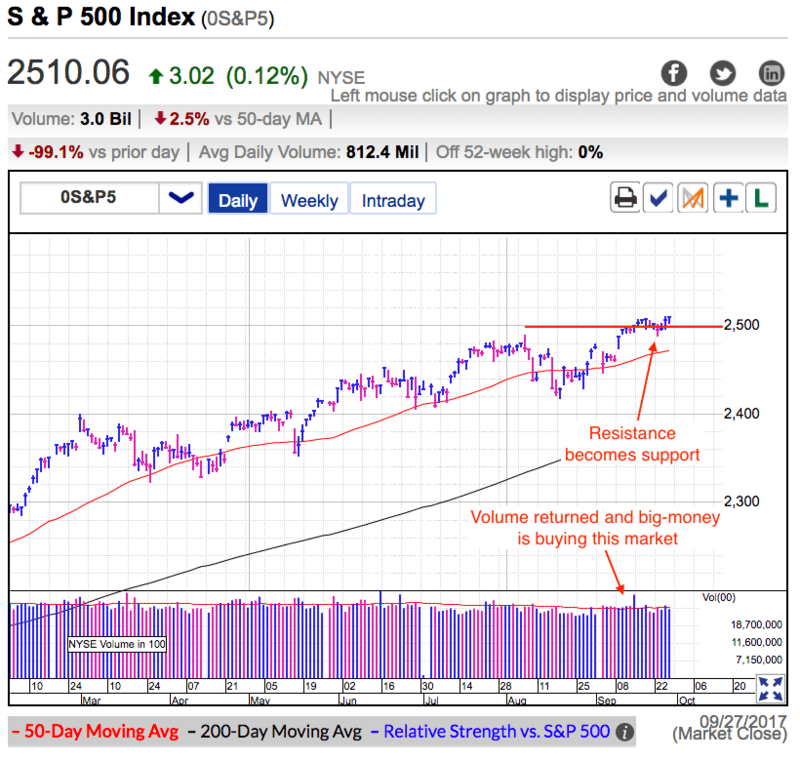 On Wednesday the S&P500 rebounded from Tuesday’s selloff but it was unable to hold those early gains and closed flat. Unfortunately for most traders these bullish and bearish biases convince them to buy the breakout or sell the breakdown, moments before prices reverse. Then they either chicken out or hit their stop-loss and lock-in their losses. To add insult to injury, prices reverse hours after the trader closes his position. Almost every single person reading this blog knows exactly what that feels like. Buy high and sell low is a horrible way to trade the market, unfortunately it happens way more often than anyone wants to admit. Directional traders make a lot of money getting here, but they give it all back in these sideways stretches. The above was a very long-winded way of saying, ignore today’s late fizzle because it is meaningless. Just like last week’s breakout didn’t mean anything, and the fizzle before that. We are stuck in a market that refuses to go down nearly as much as it refuses to go up. Don’t fall for these tricks by reading too much into this meaningless price-action. While we are in a mostly sideways market, the path of least resistance is definitely higher. Headlines have been resoundingly bearish over the last several weeks and the market has flatly refused to breakdown. If this market was fragile and vulnerable to a crash, it would have happened weeks ago. The fact we withstood wave after wave of bearish headlines means this market is far more resilient than most people realize. A market that refuses to go down will eventually go up. Keep doing what has been working. Stick with your buy-and-hold positions and add on dips. Big money returned from summer vacation and they are more inclined to buy this market than sell it. Expect this demand to prop up prices over the near-term as big money keeps buying every dip. Over the medium-term expect this resilience to pressure underweight managers into chasing prices higher into year-end. This is an old bull market, but it still has life in it. Underestimate it at your peril.